On April 26, the Clark School will host the 2012 Engineering Sustainability Workshop with a focus on solar energy. The event will start at 9 a.m. in the Kay Boardrooms at the Jeong H. Kim Engineering Building. In the morning, speakers from the U.S. Department of Energy, Bechtel Renewable Power, ATR Solartech, UMD Energy Projects and Conservation, and the UMD Engineers Without Borders and winning 2011 Solar Decathlon teams will present. The afternoon will feature brief overviews of the work of the Clark School, university and local researchers, providing quick snapshots of the latest energy ideas. Attendees will be able to tour displays featuring solar energy-focused organizations on campus and in the local area. 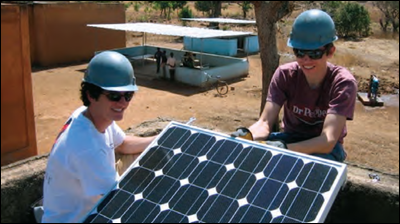 At 5 p.m., Stephen Zaminski, founder of Solar Gen 2, will give the last Whiting-Turner Business and Entrepreneurial lecture of the school year -- "Making Solar Power a Reality in California."